As part of PGSU’s ongoing effort to hear from fellow grad workers on their experiences with housing, and in light of the university’s Lake Campus plans for new graduate housing built and administrated by American Campus Communities, PGSU has put together a short (10-15 minute) housing inquiry for grad workers. (Linked here) The answers from this survey will help us better understand and build a movement around our needs as grad workers—whether we live in Princeton housing or not, on our own or with partners or children. We encourage you to fill it in and pass the survey on to your friends. The only way to have a real say in our working and living conditions is through collective action — through forming a labor union. While we work towards legal recognition as a union, we still have the power of political and collective pressure, and that is what we intend to mobilize to demand affordable and accessible housing now and for the graduate workers who come after us. We’ve been working over the past weeks to gather testimonials from fellow grad workers in graduate housing and those living off-campus, and have been conducting research on American Campus Communities, the firm to which the university plans on renting the lands across Lake Carnegie. This firm will collect rents from us (at a profit), the university will profit off the land rents it collects from ACC, and there is as yet no guarantee as to the affordability of this housing for us, the tenants. We believe rent for graduate housing should be tied to a percentage of our base stipend, in line with federal regulations for affordable housing, and that is what we will demand of our employer in the coming weeks. Join us Thursday (3/7) at the Frist South Lawn to demand action on the SHP cuts! Princeton’s administration cut certain student health plan benefits last Friday, with no consultation, two weeks notice, and no public announcement. These changes meant 67% cuts to massage therapy, acupuncture, and chiropractic services, mostly affect undergraduates and graduate workers living with chronic pain. This change affects us all: it is one of the many ways the university can unilaterally make changes to our working and living conditions without consulting us or including us in any decision-making. We demand the university administration (1) restore the full complementary benefits coverage it removed from the Student Health Plan as of March 1, 2019, until a replacement set of benefits is implemented (2) make the coming changes to the SHP public and open to real consultation by undergraduates and graduate workers. Sudden and unilateral changes to our health plan will continue unless we act together! We have power as an organized collective to demand better from the university, which has a staggering endowment and professed commitment to accessibility and “the service of humanity.” Join us to hold the university to their word! Sign the Princeton graduate student petition against taxation of tuition waivers! Princeton University graduate students have put together a petition against proposed federal taxation of tuition waivers. You can check out an explanation of how the taxation would affect Princeton graduate students, and the reasons we are demanding commitments from the university, here. You can also sign the petition here. Princeton graduate students could see their tax bills skyrocket to $11,000 or more if the Republican tax bill currently under consideration in the House of Representatives becomes law. The GOP bill eliminates §117(d) in the U.S. tax code, a provision which exempts “qualified tuition support” for research and teaching assistants from being counted towards gross income. Fortunately, students who are on fellowships would not see their tuition support counted towards taxable income. §117(a), which exempts “qualified scholarships” from taxation would remain on the books. But most Princeton students receive at least part of their funding from assistantships during their the course of their PhD program and would therefore be affected by the tax bill. Learn about our platforms on issues! Curious about PGSU’s stances on matters relating to graduate student life? Check out our descriptions of graduate worker issues and our platforms for addressing them in our Issues tab, located in the menu at the top of the page! As these platforms are constructed by graduate workers at Princeton, they are continuously evolving as we gather more input from graduate workers. Email us with your opinions, ideas, and experiences at askpgsu@gmail.com! 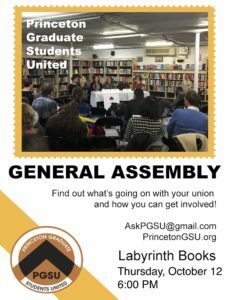 Do you have questions about unionization? Have concerns you’d like to see your union address? Join PGSU for a discussion! 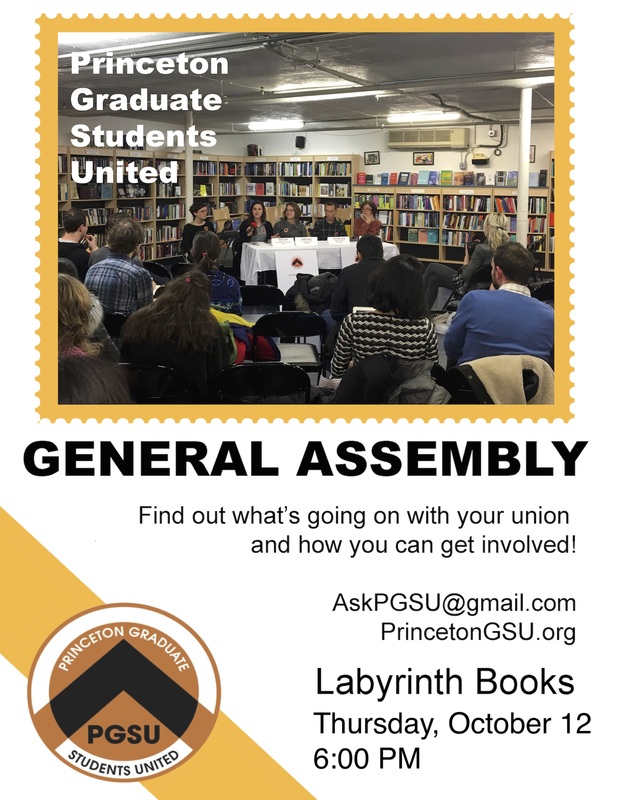 Princeton Graduate Students United will be holding our October General Assembly meeting on Thursday, October 12th at 6:00 pm at Labyrinth Books (122 Nassau Street)! Want more info? Email askpgsu@gmail.com and check out the event on Facebook! We are concerned with the language of this email and urge the university to consider the implications of what they have sent to our students, faculty, and staff. Institutions of higher learning should be places where the rights of all students are upheld without question, and where any ideology that threatens their security is courageously confronted. We wish that this had been the spirit of your opening email to our campus this fall. Instead, your message claimed that many positions on white nationalism, the rights of trans people and immigrants, and the scientific fact of climate change deserve equal treatment. We reject this idea. To insist on neutrality in the face of hatred implies an equivalence between those who fight to affirm the rights, safety, and humanity of all, and those who seek to dehumanize, disenfranchise, and incite violence against certain groups based on their skin-color, religion, gender, or sexuality. There is no room in civil, democratic society for these two positions to “debate” on an even playing field. Allowing or encouraging such “debate” does not affirm “free speech” but instead threatens many people whose safety and personhood has long been devalued. To suggest otherwise directly contradicts your email’s commendable desire to affirm the full dignity and humanity of all persons. In the current political climate—marked by reinvigorated and highly visible racist organizing, increased state scrutiny and detention of immigrants, and the rollback of legal protections for queer and trans people—we feel that Princeton should emphatically uphold the rights of its students rather than encourage them to consider attacks on their rights and personhood as valid and worthy of consideration. Princeton has a responsibility to the immigrants, trans people, and people of color in its student, faculty, and staff community to condemn any and all assaults on their rights and safety. As a research institution our intellectual and material resources at the University’s disposal are urgently needed to address the present dangers of climate change, whose harms disproportionately affect communities of color, not to debate its reality. We affirm that these issues are worthy of critical engagement–but that engagement must be critical. To imply that there is any legitimacy behind views of white nationalism or the current political assault on trans and immigrant rights is morally bankrupt and illustrates a failure in the very values that Princeton purports to espouse. Students of color, trans students, and immigrant students make an enormous contribution to life at Princeton and are part of the fabric of this diverse and beautiful university. To tolerate those who would do them harm is an affront to this community and a betrayal of our collective values. We call upon the university to unequivocally condemn climate change denialism, white nationalism, gendered violence, and anti-immigrant hatred. We urge our university to commit in concrete and tangible ways to upholding the professed values of our intellectual community and ensuring the safety of its members. As you wrote in your email: “Optimism and hope without concrete action…is insufficient”. 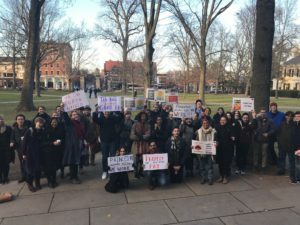 Princeton Graduate Students United (PGSU) stands in solidarity with Professor Keeanga-Yamahtta Taylor of the Department of African American Studies at Princeton. Shortly after her courageous speech at the Hampshire College commencement, she received racist, sexist, and homophobic e-mails, as well as serious threats to her life and safety. PGSU abhors and condemns these attempts to intimidate and silence a member of our academic and professional community, and we support Professor Taylor’s scholarship and commitment to social justice. In a political climate in which these threats and others like them are increasingly common and often condoned by those in the highest offices of government, PGSU chooses to speak out against such bigotry and hate. In so doing, we uphold the core values of our university: “Princeton in the nation’s service, and the service of humanity.” We urge the Princeton University administration to join the professors of the Department of African-American Studies and PGSU in voicing its support for Professor Taylor. The mission statement of PGSU affirms our commitment to standing with any member of the Princeton community whose right to free expression is threatened: “it is increasingly urgent that we have a collective voice and stand in solidarity with fellow workers, students, and community members at Princeton.” The threats made to Professor Taylor demonstrate the need for graduate students to continue to participate in ongoing fights against discrimination on Princeton Campus and beyond. The threats to Professor Taylor do not operate in isolation but are part of a visibly rightward shift in U.S. politics. Since the November 2016 elections, fascist and reactionary forces have mobilized on university campuses and advocated for violent right-wing insurgency. By empowering student workers to advocate for ourselves and our community, PGSU stands against racism, sexism, and homophobia, and is proud to declare, in the tradition of union workers, that an injury to one is an injury to all. Want to know why we are forming a union, what our rights are, and what will our union ‘look like’? We have been hearing questions on campus and put together this FAQ page so you have the information you need in making your decision to join the organizing and be a part of the process.